COMO Villa is perfect if you want ocean views and lots of privacy. With a staff that’s delighted to meet your every need, spacious rooms, a beachfront location, and exceptional restaurants, COMO Parrot Cay Resort will quickly become one of your favorite vacation destinations. You can even take part in complimentary yoga and Pilates classes, tennis, swimming, and water sports. 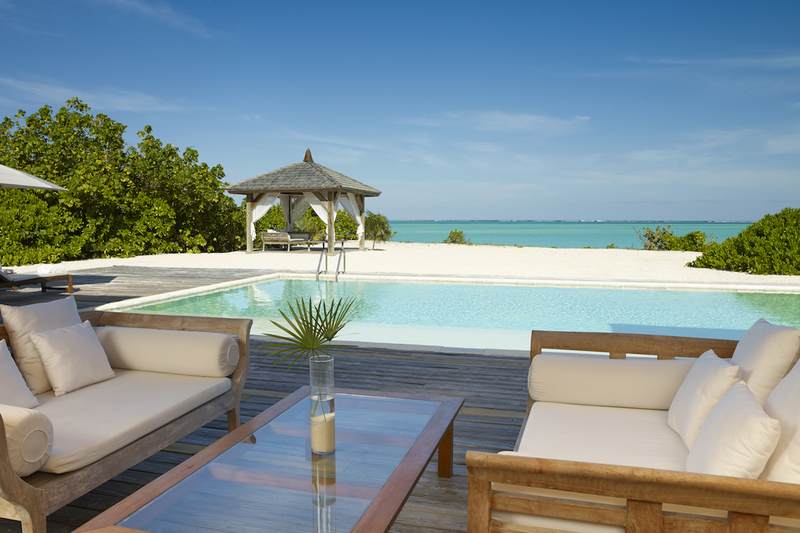 COMO Villa is a beachfront property in COMO Parrot Cay Resort, on the northern tip of the private island. This vacation rental is fully air-conditioned and great for a couples getaway. Spend the day swimming in the lap pool, sunbathing on either side of the deck, and unwinding on the beach. Gauzy curtains in the beachside palapa flutter in the island breeze, and a dining table sits in the shade on the veranda. The pool is heated, and the ocean is steps away. COMO Villa has a fully-equipped kitchen with a coffee bar, large countertops, and lots of space. The large living and dining room has cathedral ceilings and all-white decor, plus sliding glass doors that open to the deck. Wooden accents and soft whites throughout lend an airy elegance to the villa. There are three bedrooms, and each has an ensuite bathroom, exterior access, and an ocean viwe. Two bedrooms are large suites with their own private patios, shower gardens, and four-poster king beds. The third bedroom can be made up as a king or two twins. Daily housekeeping and butler service will maintain the villa and lighten guests’ load throughout their vacation. COMO Villa is less than a mile from the resort’s main lobby, which makes it easy to explore all the island has to offer. North Caicos is only a 10-minute boat ride away, and Providenciales is a 45-minute boat/taxi ride away.